Window film is a sheet of strong polyester laminate treated in variety of ways to improve the look and performance of existing windows. One side has a scratch-resistant coating and the other has an adhesive that bonds the film to the glass surface. View video above to learn more information. Architectural window films work by controlling the passage of solar energy into room spaces, improving the insulating performance of windows, providing endless decorative opportunities, or substantially reducing the safety and security hazards associated with fragile, easily shattered glass. Solar control window films for homes and commercial buildings help control the sun’s radiant energy, reducing the influx of heat, enhancing outward visibility by reducing harsh glare, and nearly eliminating the damaging and dangerous effects of ultraviolet light on our skin, eyes and interior furnishings. Low-e window film enhances the solar and insulating performance of a building’s windows, reducing excessive solar heat gain – reducing cooling loads and peak demand. They also provide year-round benefits, reducing heating costs by improving window insulating performance. Do I need an appointment to have my car tinted? We recommend calling us in advance at 818-989-4711 to schedule your appointment as it typically takes 2 hours to tint your vehicle. How long does it take to install window tinting on my car? Llumar window film can be installed on most vehicles with in 2 to 4 hours. Our professional installers have more than 30 years experience in the application of window tinting to insure a quality installation that will last a lifetime. You are welcome to drop you car off or wait in our waiting room. How long will window tinting last and what type of warranty do I get? With proper installation by a trained Llumar dealer, your window film will last for a lifetime! Llumar is so sure that their film won’t peel, bubble or crack that they back their product with a limited Lifetime Warranty for as long as you own your car. Does window tinting have to be dark to work? 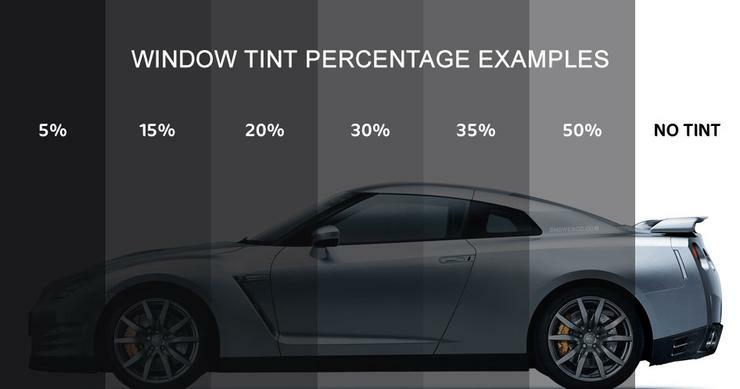 It is a myth that window film / window tinting has to be dark to be effective. Formulaone Professional Glass Tinting installs both standard and high performance window films from LLumr. These window films come in several different light transmissions – all being neutral in appearance. Come into our show room to pick out the color and film that’s just right for your car home or office. Can I choose how dark I want my windows to be? You can choose from varying degrees of darkness as indicated on the chart below. We currently accept all major credit cards and cash, sorry no personal checks. Do you offer FREE estimates on residential and commercial jobs? Formulaone Professional Glass Tinting offers free estimates for both residential and commercial jobs. Please call us at 818-989-4711 and one of our friendly staff will be happy to schedule your free window tinting estimate. How long does it take for window film to dry? Some safety and security window films will always have a longer dry- out period due to their increased thickness. Thicker films and a less than perfect drying climate will lengthen the dry-out period. Dry-out times can vary from a few days to as long as several months. Window film creates an efficient vapor barrier between the glass and the film. During the installation process, your window tinting installer will remove as much of the mounting solution as possible by using a squeegee, although a small amount will remain. Trapped installation moisture can cause small water puddles and/or a slightly cloudy look. This is normal and should be expected. Do not attempt to pierce a water puddle during the dry-out period. This water and cloudy look will eventually dissipate. Attempting to pierce a water puddle in an effort to drain moisture will damage your film. This damage would not be covered by warranty. Llumar window films utilize numerous types of scratch resistant coatings during the manufacturing process. This scratch resistant coating is applied to the exterior surface of the window film to protect the film from normal wear and tear and abuse by humans by the natural environment. While most quality films such as Llumar are scratch resistant, no window film is entirely scratch proof. With a small amount of care and precaution, window film can provide you with years of service and protection. What is a thermal pane or insulated glass window? The term insulated glass, or (IG) unit, does not refer to the physical makeup or construction of the glass, but how the glass is fabricated into an IG unit. An IG unit consists of two sheets of glass separated by an airspace of constant thickness. ‘Spacer’ or edge seals are placed between the two sheets of glass to create airspace. The seal between the glass sheets is accomplished through the use of a variety of different types of materials and sealants. In addition, a desiccant is incorporated into the edge seal technology to absorb water vapor that migrates across the seal. The intervening airspace reduces heat transfer by conduction and convention through the glass. In order to increase the insulation performance of the IG unit, inert gases such as Argon and Krypton may be used to replace air between the panes of glass. Both Argon and Krypton are invisible, harmless, odorless, and heavier than air, which results in slower convective movement and a reduction in heat transfer. IG units pose a risk of thermal stress fracture for many types of dyed or sputtered films that absorb excessive amounts of heat. Will window tinting cause my thermal pane windows to break or blow their seals? When deciding to purchase window film for your home or office, the subject of glass breakage may come up. Industry wide, glass breakage caused by window film occurs in approximately 1/10 of 1% of all installations. In most cases, when breakage is reported, the film installation was not the sole cause for the failure. Breakage is usually the result of flaws, imperfections, or expansion restraints that existed in the glass or window framing prior to the installation of the window film. Window films reduce the transmission of damaging and harmful solar radiation. By increasing the amount of solar radiation absorbed and reflected by the glass, less solar energy can enter the building. When glass is subjected to the effects of solar radiation, the normal and immediate result is the increase in the temperature. The sun naturally warms the glass as its powerful energy passes through. Glass with film has an increased ability to reflect and absorb solar radiation. Because window films are usually installed on the inside surface of the glass, increased amounts of solar radiation will be absorbed as it passes back and forth through the glass. Some window films can cause excessive solar energy absorption in certain kinds of glass. The result can be extreme thermal expansion and stress, which can cause glass breakage or seal failure in an insulated glass (IG) unit. Additionally, thermal stress fracture can result from uneven temperature distribution across the surface of a glass plate. This is typically caused by partial shading of the window. To avoid problems, you must select the correct window film for your glass. To do this, it is helpful to know how glass reflects, absorbs and transmits solar radiation and how its ability to reject solar radiation will change when a window film is installed. In the past, dark or highly reflective films were very popular and used to attain maximum solar energy rejection performance. Unfortunately, dark reflective films typically have high absorption ratings which can increase the risk of glass breakage and seal failure. Thanks to the technological and manufacturing advances used in today’s window films, it is no longer necessary to purchase very dark films to achieve significant solar energy rejection performance. Today’s high-tech films provide impressive performance without absorbing excessive amounts of solar energy. Best of all these films save energy, reduce ultraviolet transmissions, increase interior comfort and give a contemporary appearance to a building or home. All quality window films for both residential and commercial uses are warranted by the film’s manufacturer. At the time of the printing of this booklet, most residential window films are warranted for at least ten years. Due to the wide variety of window films now available, consult with your window tinting professional about the specific warranty of the film you select. Will window film effect my indoor plants? Generally speaking, the application of window film will not have an affect on the growth of most indoor plants. Near growth and flowering may be retarded in the initial days after your window film is applied as the plant adjusts. In some cases where plants are in constant, direct light for long periods of time which causes wilting, the plant may actually thrive after the window film is installed. Where there is concern about possible plant growth being affected, it is recommended that owners move the plant, as a test, to another part of the room to stimulate a less lighted area before the window film is applied. This move will help to judge what the potential affects might be. In addition, it may be wise to consult a local nursery for advice, which is also recommended in the case of exotic plants. Can you apply window film over decals or stickers on glass? Many windows, especially those on storefronts, have stickers, decals, burglar tape, and other such items on the glass. Depending on the circumstances, these might have to be removed. Your window tinting professional should discuss the potential problems with you and determine what to do with any decals. If they are not highly raised above the glass, window film can be applied over them. However, this will create a poorer bond on the decal than on the glass. More highly raised stickers should be scraped off. Burglar tape and alarm contacts are also found on windows. Tape is usually only slightly raised above the surface of the glass. Film can be installed over such an irregular surface, but customers should be advised that the installation will not be tip quality. Alarm contacts, however, should be removed before applying film, but should not be done by the window film installer. It is better to ask you, the customer, to contact your security company to remove and replace the alarm contacts. Application of window film to the inside surface of skylights is very difficult. The film tends to hang down at a ninety-degree angle, and is extremely difficult to handle and apply to the glass surface. Another difficulty is that many of the newly designed homes today have tunnels leading to the skylights. This along with the difficulty level is the main reason why you should make sure that the window film company you choose has the specialized equipment and training to do skylights properly. The cost of tinting skylight can be slightly higher than tinting other windows. This is due to the difficulty and height of most skylights as well as the length of the tunnel leading of the windows. The application of window film to skylights is more restricted versus tinting other windows in your home or business. Home or business owners should consult with their window film professional and be aware of any restrictions. Can window film be installed on tinted glass? Tinted glass is a major absorber of heat, and leads to a great deal of stress within the glass. Window film itself absorbs a certain amount of heat. If the combined absorption of the window film and tinted glass if very hight, this can result in the glass cracking as a result of thermal stress. Thermal stress may also occur if the sheet of glass has not been installed with the appropriate amount of care. An example of this would be if the edge of the glass is either chipped or damaged. In cases where tinted glass is tempered or strengthened, the application of window film is unlikely to result in the glass cracking or fracturing. If you have tinted glass or are unsure if your glass is tinted, ask your window tinting professional which films are safe to install. Though the selection of films is limited, there should be a film available to solve your solar control needs. Our home is under construction. When should we have the windows tinting? Do window treatments need to be removed for the installation? The majority of the time, a qualified window tinting installer can easily work around most window treatments. In the event a window treatment restricts an installation, this instance should be discussed with the customer at the time of the estimate. During the window tinting installation process, most installers use a soap and water mixture (such as baby shampoo or a dishwashing liquid, such as â€œDawnâ€). Your window tinting installer will use this mixture to both clean and install the window film. This soap and water solution is recommended as it does not stain or discolor any fabrics, woodwork, or paint. Can window from be installed on the outside of the window? While most window film companies use scratch-resistant films, you should ask to make sure. If a company has an extra charge for a scratch-resistant film, you may wish to contact a few more companies for quotes. With todayâ€™s technology, scratch-resistant films are considered standard. Fading is a complex issue. Each and every material will fade at different rates from exposure to ultraviolet radiation as well as other contributing factors. An example of this is the different color dyes in fabrics. Red and green colors tend to fade faster than other colors.